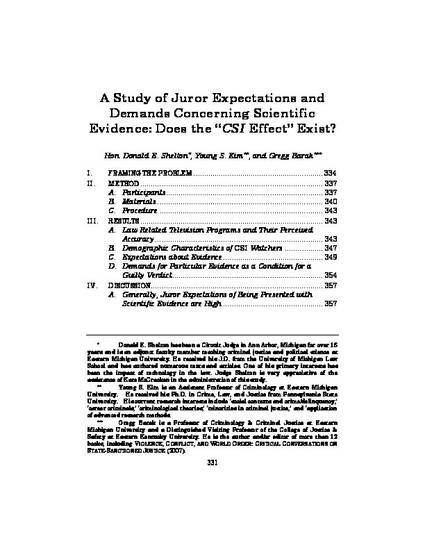 A Study of Juror Expectations and Demands Concerning Scientific Evidence: Does the “CSI Effect” Exist? Many prosecutors, judges and journalists have claimed that watching television shows like CSI have caused jurors to wrongfully acquit guilty defendants when no scientific evidence is presented. This is the first empirical study designed to investigate whether the “CSI effect” exists. This survey of 1027 persons called for jury duty in a State court looked at jurors’ television viewing habits, their expectations that the prosecutor would produce scientific evidence, and whether they would demand scientific evidence as a condition of a guilty verdict. While the study did find significant expectations and demands for scientific evidence, there was little or no indication of a link between those preconceptions and watching particular television shows. The authors suggest that to the extent that jurors have significant expectations and demands for scientific evidence, it may have more to do with a broader “tech effect” in our popular culture rather than any particular “CSI effect.” At the same time, this article contends that any such increased expectations and demands are legitimate and constitutionally based reflections in jurors of changes in our popular culture, and that the criminal justice system must adapt to accommodate jurors’ expectations and demands for scientific evidence.